Do not hesitate to ask for a quote before booking as prices may vary according to certain conditions! A Lussault sur Loire in the heart of Montlouisien vineyard. Beautiful cottage located in a green setting with a landscaped garden closed, the cottage is an old barn completely restored, true house of character and charm with its stones and its exposed beams. Founded before 1585 by prominent figures in the King's service. During your stay in our cottages, you will have at your disposal some authentic documents (testament of April 6, 1651), copied to the departmental archives of Indre et Loire, plus our personal research. 15 minutes from Tours, near the Château d'Amboise, the Château de Chenonceau, and the closed Lucé (the famous house of Leonardo da Vinci). Unique and unforgettable adventure, balloon flights take place from the 1st April to 30 October, in the morning or late afternoon. Out of season, it is still possible to fly but only in private nacelle 2 to 5 people. The flights are mainly from the prestigious sites of Amboise, Chenonceau, Chaumont. A three-hectare park is at your disposal to share with Lulu the royal turkey and his companion, a couple of peacocks, a dozen chickens and their rooster. If you have bicycles you will find at the end of the park the entrance to the circuit 'Loire a vélo' for large, safe walks. Bike rental by a professional by appointment! 1 Bedrooms with a double bed. 1 mezzanine bedroom with two single beds. The fitted kitchen, gas hob, oven, fridge, microwave, coffee maker, dishwasher, washing machine. 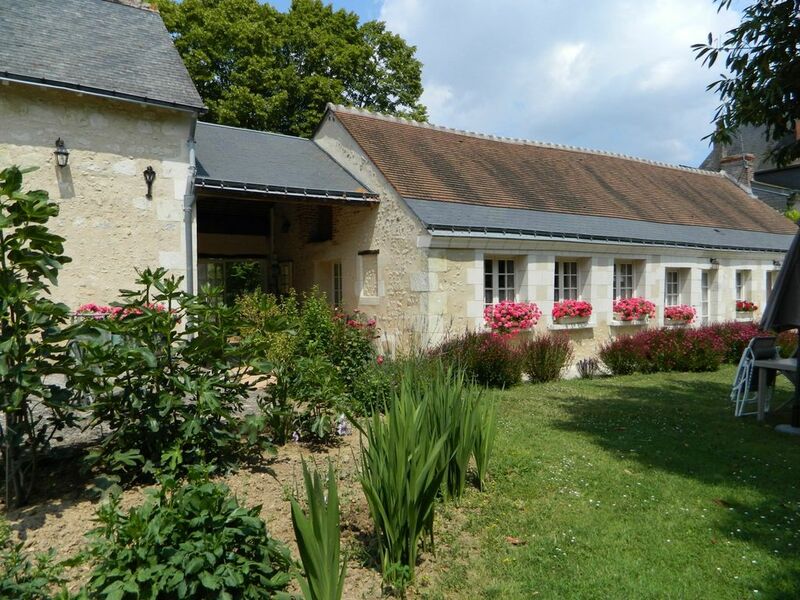 A lovely two bedroom gite, set in beautiful surroundings. The facilities were excellent with washing machine etc in the kitchen. The owners left us some of their chickens eggs for breakfast which were delicious and were very helpful giving us advice on what we could see in our two days in the region. Peacocks and peahens roamed the grounds. Idyllic! This place is a gem. Madame Rose has so many nice touches around the place from greeting guests with a bowl of chocolates to having a thoughtfully well-stocked guest house complete with hairdryer, 2 clothes drying racks with hangers, a towel warmer in the bath, freshener in the bathroom, sugar, paper towels and even a potty seat for a baby. A nice touch was that the guest house came complete with bath towels and bed sheets which was not the case at another gite we rented. Thanks so much for all these lovely touches. I wish we had had more time to look around and walk the grounds. Nous avons eu un merveilleux sejour a cet appartement. Les proprietaires etaient fantastiques. L'appartement avait tout ce qu'on avait besoin, meme avec les oeuf frais et les pommes complimentaires. Merci de tout coeur. Très beau gîte, confortable et paisible. Propriétaires vraiment très sympatiques et toujours prêts à nous aider lorsque nous avions des questions sur la région et aussi de petites attentions tels que les oeufs frais qui étaient excellents. Nous y retournerions sans hésiter. La maison, la gite et m.me Rose: tout parfait!! Nous avons passé d'agréables vacances dans ce gite très agréable, situé dans un endroit très calme à proximité des pistes cyclables. Nous avons apprécié l'accueil et la gentillesse des propriétaires. Tarif de base pour 4 personnes ! Caution 300 euros. En Juillet et en Août la location se fait à la semaine .